All configured tunnels can be viewed and controlled from the Network > VPN > Control page. 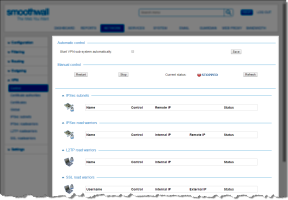 The Smoothwall’s VPN system can be set to automatically start when the system is booted. This allows roadwarriors to tunnel in without having to wait for the system to be manually started. It also allows site-to-site tunnels that are initiated on the Smoothwall to automatically negotiate a site-to-site connection. 1. Go to the Network > VPN > Control page. 2. 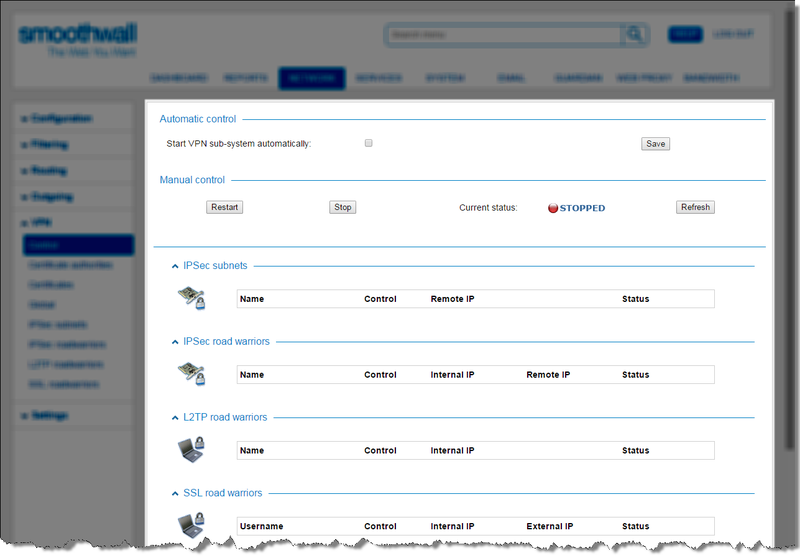 In the Automatic control panel, select Start VPN sub-system automatically. 1. Go to Network > VPN > Control. 2. From the Manual control panel, click Restart. Current status changes to Running when all tunnels have connected. 2. From the Manual control panel, click Stop. Current status changes to Stopped when all tunnels have disconnected.  Name — The name given to the tunnel. • Down — Close the tunnel connection.